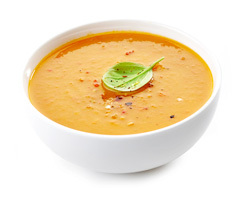 Each day we offer a variety of our hearty signature soups with only the finest ingredients. From classic favorites to unique tastes which tantalize the tastebuds our rotation of soups include vegetarian and non-vegetarian options which all feature powerful flavours in each spoonful. Please contact your local PappaRoti Cafe & Bakery to find out more about today’s soup of the day.